The Noko report filters and grouping options let you easily focus on specific types of entries, and aggregate time to see the totals for specific time periods, projects, project groups or people. Report filters let you focus your report to show only specific types of entries. Selecting a filtering option will instantly re-run the report and update the page. For extra filtering power combine these filters—for example, you can opt to see only unbillable hours by contractors. Your Noko reports can be optionally grouped in up to two levels and use aggregations instead of individual entries. One of the most common uses for this are weekly timesheets, which show how much time in total has been logged by each of your team members. Indeed, Noko comes with a handy list of presets, to quickly show you weekly or monthly timesheets, as well as daily totals and quarterly project reports. The above preset is for a weekly timesheet. The preset selects grouping by nothing, showing totals by weeks (Sunday to Saturday), aggregating over all projects (projects are not listed individually) and showing individual person's hours. If you change a grouping or aggregation option, the report will instantly update. 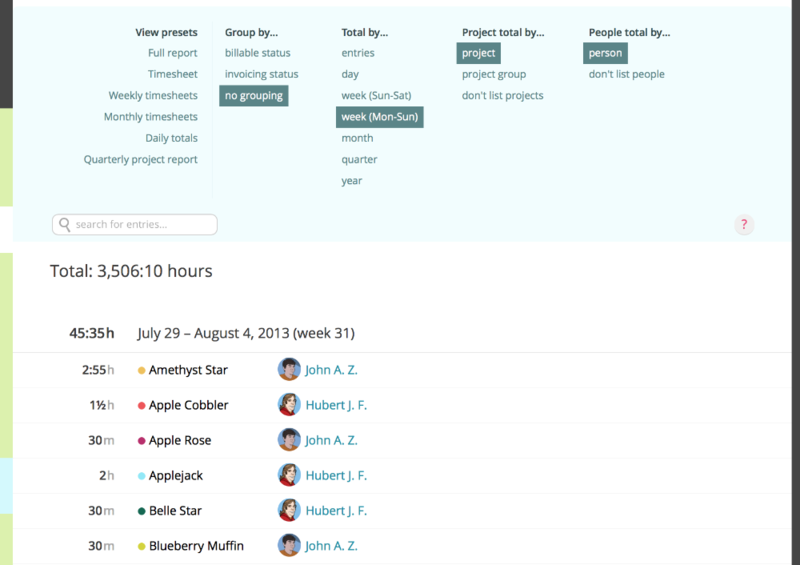 Let's say you want to break out the timesheet by showing individual projects. Just click on Project under Project total by…. When you're aggregating time periods, if you hover over the row that lists the time period (in above screenshot that's "July 29 — August 4, 2013 (week 31)") you'll see a little report button to run a report over just this exact time period. This is great when you want to dig deeper into the data, for example if you find a week where you'd expect more time being logged than there actually is. Note: as soon as you choose to aggregate or subgroup entries, you can no longer edit entries as only aggregated information is shown.